Do I understand the deck? Do I know how it is supposed to win and how each card contributes to that strategy? It is also important to set realistic goals for the deck on its maiden voyage. I shouldn’t expect to go 4-0, or win the PPTQ. I do want to know if I like the deck and if I want to continue playing it. I also want to know if the strategies and tactics I have thought up are correct. 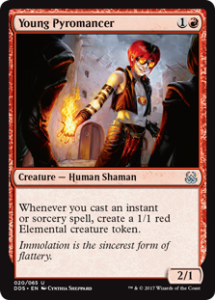 The first time out, I went with a Mardu Young Pyromancer deck featuring Thoughtseize, Bedlam Reveler, and Lingering Souls (see full list below). Note to self: Bring lots of Elemental tokens. Dice are nice, but it helps everyone if it is clear what are tapped, what have summoning sickness, etc. This is a variation of a RDW or burn deck. While these are fairly easy to pilot, I will need to be very efficient with my spells – I want to get the maximum value out of everything I cast. Strategy – How Does This Deck Win? On the face of it, it goes for board advantage via the removal – Lightning Bolt, Terminate, Fatal Push, etc. – while creating 1/1 Elementals from the Young Pyromancer. 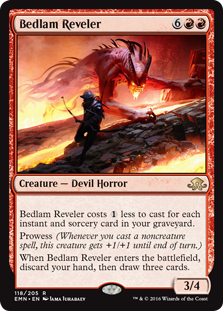 I want to get the Bedlam Reveler out quickly so I can get the prowess triggers as well. So I want to start burning and churning as quickly as possible. A few of the cards, Thoughtseize in particular, will cost me some life to play. This is common in Black – life is simply a resource to be used to win. Collective Brutality could let me gain some life, but I need to be mindful of whether or not I am winning the race. This deck wants to take an early advantage – get the opponent playing defense early so they don’t get to establish their plan. Tactics – What do I need to do? As mentioned, I want to maximize the value of each spell. And I want to get a very fast start. The obvious thing is to make sure I am getting one or more Elementals off each instant or sorcery. I also want to get the prowess triggers from the Reveler. However, The Bottom Line is I don’t want to sit on spells. They have value in the graveyard and there is some recursion here. In general, I *think* I want to Bolt the player. However, if I am behind, Bolting an attacking creature and getting the Elemental as a chump blocker might have to be done. Make sure this is done BEFORE declaring blockers otherwise the Elemental will be watching the damage go through. Sacking a fetchland will make Fatal Push that much better. So, keep those around unless I need the mana or color. We will see how this goes. I’ll try to post my results Friday along with my commentary on what worked and what didn’t. Well, I went 1-3 Thursday night, but I will say that was a success based on the goals I had set earlier. I played Tom Lowry and he recorded the match; hopefully he’ll post the video so you can see me learning the deck along with our running commentary. Game 1 went very long as I needed to do a lot of thinking when making choices. I was able to generate a ton of Elementals and Spirits, so that part of the deck worked. It was a grindy battle, but he finally got a ton of counters on his Vault Skirge which gained him the life he needed to withstand the onslaught. Game 2 ended in a draw as time was called - game 1 was that long. Elves! You know I love those little green men, at least in Legacy. Game 1 was going fine, but I didn’t get rid of his Shaman of the Pack with my Inquisition - and I knew he had it in hand. Game 2 - I kept a one land hand as I had a ton of removal. Which kept his board very clear for a long time. “How much removal do you have?” he asked. “All of it.” I answered. However I didn’t get the gas and he was able to build his board and came through on the strength of an Ezuri pump. Yay! I win a game *and* match! Not a whole lot to say here - deck worked as expected. I did grab a Dreadbore with mana open just as he was about to ultimate Liliana of the Veil on his turn. Whew! This went a little faster than the first match - no cameras, a basic familiarity with the opposing deck. Game one went quickly in my favor. Not to take anything away from my opponent, but I had to mull to 5 in Game 2 and to 6 in Game 3. Opponent said none of these games were “good” - all were all somewhat one sided - but I assured him that I enjoyed the match and that’s the nature of the game. Got to know a little about the meta - I tried to spend some time after each match talking with my opponent. I *think* this is one of the best ways to learn how to play better - get some constructive criticism from other players. Saw Modern Elves in action - again, I love those Little Green Men. A special thanks goes to my opponents who put up with my taking notes and thinking out loud. I look forward to the next time I can run out this deck and have some fun!